Engadget giveaway: Win an outdoors package with goTenna and more! Every other week Scott Jon Siegel contributes Off the Grid, a column on gaming away from the television screen or monitor. This game was clearly made for me. An analog game about developing digital games? It's like they were listening to my dreams. The "they" in this case is Pink Godzilla Games, a hip little video game store based in Seattle. Although their current claim to fame is a ping pong tournament against the Penny Arcade boys, they've also recently gotten into the analog game business. 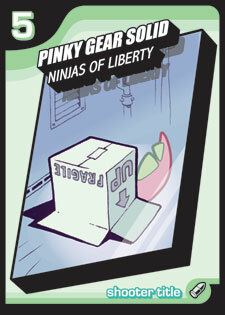 At PAX 2006, they debuted the beta version of the Pink Godzilla Dev Kit, a full-color card game designed by attorney(!) Christopher Rao. It's all about creating video games, and the creators have certainly done their homework when it comes to appealing to the gamer crowd. In-jokes and references abound in this strategy title about everyone's favorite fantasy job. In PG Dev Kit, all players are competing video game developers, racing to create the hottest new games across four genres: shooter, fighter, RPG, and music. Players earn points by having their video games "go gold," an industry term we're all too familiar with at this point. A completed video game requires at least four cards: a title card (like Pinktroid Prime), a character card (like Jumpman), and two separate "gear" cards (like potions and gun-swords). After those initial four cards are played, weapon upgrades, additional characters, and easter eggs can be added to a game to increase its total point value. Certain titles, characters, and items are only applicable to certain genres, however, so players must develop their titles carefully. The game ends when the first player reaches four completed video games. The points are then tallied, and the highest score wins. Most of the strategy in the game comes from the "Resource Row," a set of five cards that are available to all players during their turns. If a player needs one or more cards from the Resource Row for one of his games, he can either trade cards from his hand, or enter into an auction, which gives all players an opportunity to bid for the cards in question. The Resource Row adds a subtle bluffing element to the game, as well as allowing players to more directly foil the success of their opponents. If I know my rival needs a title for her RPG, and there's one in the Resource Row on my turn, I might trade for it to prevent her from completing her video game. I'm a horrible person, I know. Pink Godzilla Dev Kit's a blast to play, and its enjoyability has a lot to do with its gamer-centric style. The characters are unique and cute, and all the title cards are parodies of classic and contemporary video games (like Samba de Pixel and Osu! Tatakae! Team Ninjas). The card art is also terrific, and ranges from 8-bit to manga-esque. From the ground up, Dev Kit's designed for gamers, by gamers. It would be fun on its own, but the in-jokes and gamer cred definitely give it an edge. Dev Kit's biggest flaw at the moment is its presentation of the rules, which can be fairly confusing to first-timers. The included manual is laid out in a somewhat illogical order, and the game's myriad of rules, instances, and special cards are presented in a dry, uninteresting manner. It's a fun game, with a fun concept, and yet none of that fun seems to make it into the rules. For beginners, the first play-through will mostly be a guess-and-check procedure, and it's even recommended that new players skip the game's auction element altogether. But once you've got a handle on how to play, you're going to get sucked in. It's an addictive little game, which earns a whole lot of bonus points for its tie-ins to the game industry. It's not going to make you a better game developer, but you'll feel like one for at least a little while. Pink Godzilla Dev Kit is designed for 2 to 4 players, although a list of rules for a playing solo can be found on the official website. The beta version of the game is available for purchase online, although supplies are limited. The final version will be released later this year, with higher-quality packaging, cards, and some slight tweaks to the existing deck. Special thanks go out to Joystiq reader Kenofthedead, who turned me on to this game. Scott Jon Siegel is a fledgling game designer, and fancies himself a bit of a writer on the topic as well. His words and games can be found at numberless, which is almost always a work in progress.